Remember a couple of weeks ago when -12 degrees felt warm? 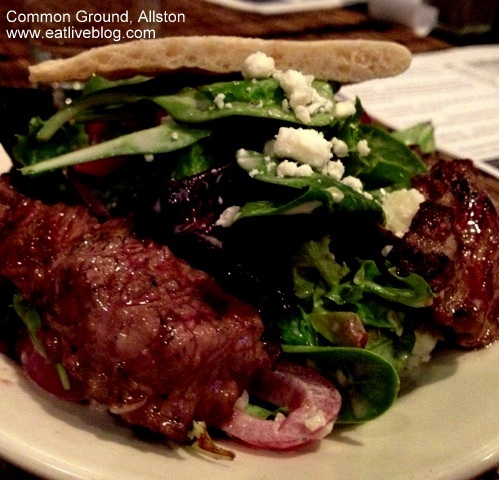 Well during that week, actually on the coldest day of that week, the Boston Brunchers headed out to Common Ground in Allston for a special “Dinner Edition” of the group. 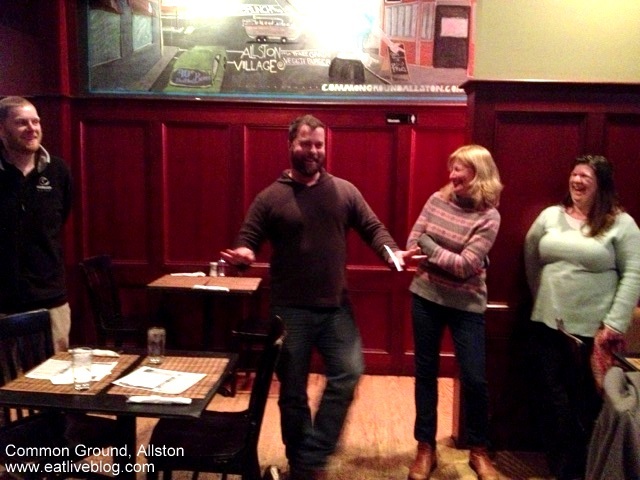 I was a little worried that the turnout would be low because of the cold, but 16 Brunchers showed up ready to sample Common Ground’s newest gastropub menu items. As we showed up we were greeted by an extremely enthusiastic Bob O’Guinn, the owner of Common Ground. Bob stuck around all evening, introducing each plate and his staff each time something new came out. But the thing was, Bob’s enthusiasm was not an act. It was extremely obvious to all of us that he truly loves food and people, and that is why Common Ground has been around for over 16 years. This restaurant is very clearly a labor of love. This really shined when Bob was telling us about the Sweet Potato soup, and a couple of diners asked for it without blue cheese. 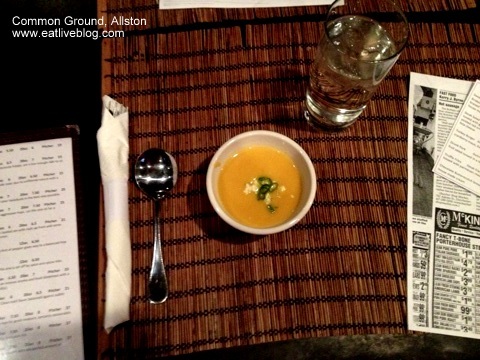 He was able to convince almost everyone to try it with the blue cheese because of the flavor development of the soup. And you know what, the man was right! The blue cheese cut the sweetness of the soup with a perfect salty pungency (in a good way). Tonight we were tasting the restaurant’s new gastropub items that were about to launch. Chef Jamie Suarez came out to greet us and talk a little about the menu and how he plans it. Seasonal and local were definite themes, as was homemade. Not only does Common Ground bake in-house, but they even go as far as making their own mayonnaise…which made the Truffle Fries with Pesto Mayo pretty much impossible to resist. My two favorite dishes of the evening were the Steak over Greek salad (the marinated onions were perfect and the steak was tender and flavorful), and the Drunk Pork. Oh Drunk Pork….this good little Jewish girl loves you! The pork belly was braised in Guiness and served w/ fresh fruit with a lemon honey glaze. Man was this dish good. The sweetness of the braise…the tenderness of the pork…the crunch and brightness of the fruit….every mouthful was a delight. 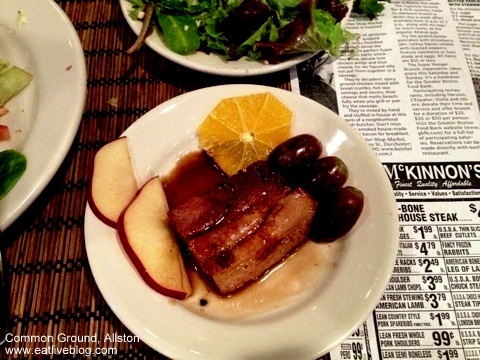 Drunk Pork – Guinness Braised Pork Belly with fresh apples, oranges, and grapes in a lemon honey sauce. We also were able to sample the Turkey Burger (topped with turkey bacon and cranberry mayo) and the Brisket Turnover. The burger was WELL above par, with one diner not even convinced it was not real beef! The turnover, however was the disappointment of the evening for me. It was akin to an empanada stuffed with brisket. That definition alone makes me drool. Sadly, the real thing was just too dry and not special. It may have suffered from being compared to the rest of the tasting that evening. We finished the evening off with a Chocolate Butterscotch Bread Pudding topped with whipped cream. After all I had eaten that evening, I could have eaten an entire pan of this. 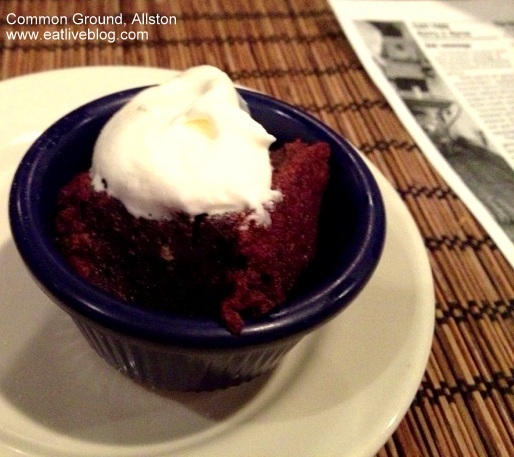 One of the many things that surprises me about Common Ground is their baked goods. They are consistently innovative and extremely well executed. This one was no exception! The thing that separates Common Ground from the majority of dining establishments in Allston is the thought and care that goes into everything they execute…From the food, to their unusually large selection of local and microbrews…these guys think of it all. 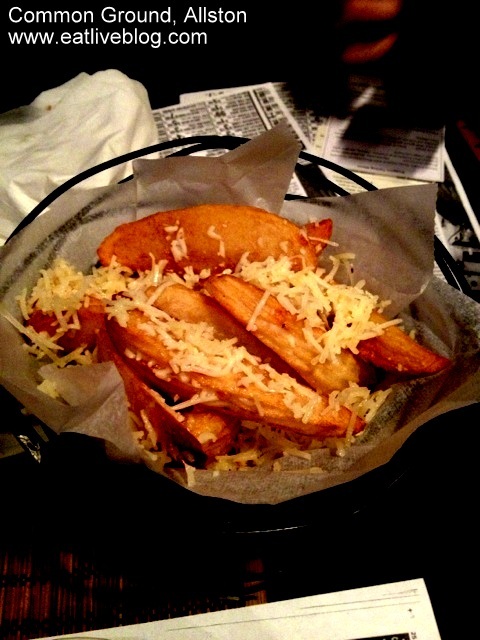 Don’t make the mistake of writing them off as a college neighborhood bar, you will miss out on some amazing eats if you do! A special thanks to Common Ground, Capability Mom and Pragmatic Mom for inviting the Boston Brunchers to sample the new Gastropub menu. While the meal was provided free if charge, as always, all opinions are my own. Thank you so much for coming to our event on such a icy cold day! I’m so glad that you could make our event. I appreciate your kind words on our food. I’ll let Jaime know that we need to fiddle with the empanada a little more. Glad you liked the rest of our GastroPub tasting meny. This was such a fun and delicious dinner!